Until now I had only ever read one short story by de Maupassant. Does anyone want to hazard a guess which one it was? 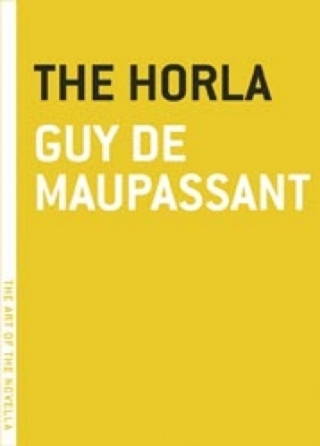 This edition of The Horla (roughly translated: “the outsider”) is actually one story told three ways. The Horla (1887), Letter From a Madman (1885) and finally The Horla (1886). Melville House puts the 1887 version first and I think they did the right thing. Not only is it the longest but it is also the most substantive. Letter from a Madman might be interesting in itself, but I think it would have been much less so if I hadn’t had the background of the 1887 version. Finally by the time I got to the 1886 version I am not sure I cared all that much. The basic story is the protagonist’s descent into madness. Insomnia leads to paranoid delusions. In the end he thinks he has trapped the invisible horla in the house and sets it on fire. What’s that? Oh yeah, when he locked the house up and set it alight he failed to remember the servants sleeping on the top floor. The Verdict: I was intrigued by the very real seeming descriptions of the descent into madness. “The Necklace” is the story title that pops to mind when I think of de Maupassant (can't remember the French title). Is that the one you read? I re-read The necklace two weekends ago and am thrilled at his skill at creating the most memorable irony. I need to read The Horla.